Before we go foraging for mushrooms - Care is needed when picking mushrooms, mushrooms can come in different shapes and sizes and are only easy to identify once mature. A small immature mushroom also known as a button mushroom will have different characteristics to one that is mature. A button mushroom may not grow a stem until later in its life and may be different in colour. Having said this, don’t leave it too late to pick them. 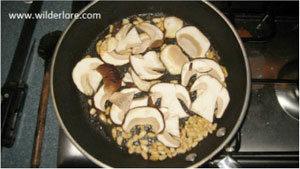 Maggots have a tendency to eat and live within over-mature mushrooms; these mushrooms should be considered inedible. Never pick fungi that are smaller than the circumference of your thumb and forefinger touching together on the same hand (adult size) or where the stem, pores or gills are not visible under the cap. 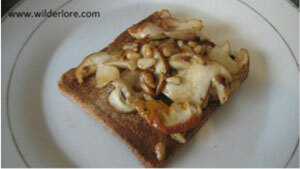 Don’t consume fungi that have become a home for maggots and any other grubs or insects for that matter. Only consume fungi when 100% positive on the identification. Always have landowner’s permission to forage. Never pick too many, leave some for the environment! 80% of trees are dependent on fungi to live! 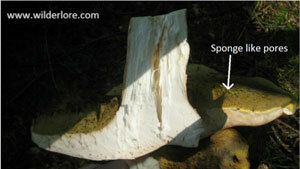 Some of the most common and valued edible wild mushrooms come under the bolete (bol-ee-tie) family. Bolete mushrooms are unique and therefore easy to identify. All members of the Bolete family have pores underneath the cap; pores are tiny tubes that distribute the mushrooms spores (see fig 2). 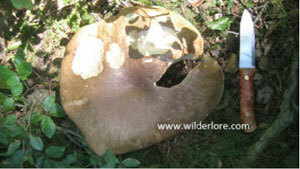 Bolete members also grow mostly on the ground as opposed to on trees and have an umbrella shaped cap. Some Bolete mushrooms are poisonous, these are simple to identify as the pores all have a red, brown or a distinctive yellow colour to them. Identification - as they are in the Bolete family - they have pores underneath the cap (white/cream colour turning yellowish with age), grow on the ground and have an umbrella shaped cap. The stem is usually swollen and covered in a white net like pattern. The flesh is white throughout. The cap is dry to the touch if the weather is fine and is brown in colour becoming white towards the edges . They grow in broad leaf woodland mainly near beech trees. My favourite way to cook penny buns is to fry them with pine nuts and lemon, then season well with salt and black pepper. I’m not sure about the quantities of this recipe as I almost always cook without recipes and enjoy experimenting slightly each time I cook. I enjoy cooking over a fire but in this case I didn’t have the landowner’s permission to do so so I cooked them at home. Chop the penny buns into slices just thicker than a pound coin. 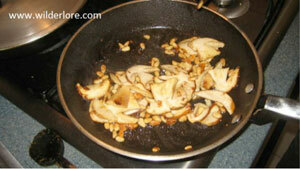 Heat up a drop of olive oil in a frying pan until hot, place the pine nuts into the pan and cook until slightly brown. Place the penny buns into the pan and add a squeeze of lemon juice, season well with salt and black pepper. Cook until the penny buns are a golden colour. Serve on toast. anyone know where i can buy spores? i want to grow cep mushrooms (and other types) but these are hardest to find a spore-supplier for? You can buy them online although i’m not to sure i agree with it; funding a foraging market can lead to over-foraging. 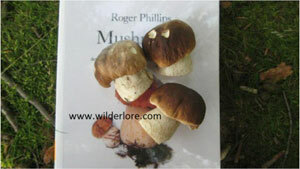 do you by any chance know any small outlets selling ceps – penny buns? Looking for some for Christmas Day vegetarian dish.